High Quality Content by WIKIPEDIA articles! Central Asian classical music is called shashmaqam, which arose in Bukhara in the late 16th century when that city was a regional capital. Shashmaqam is closely related to Azeri mugam and Uyghur muqam. 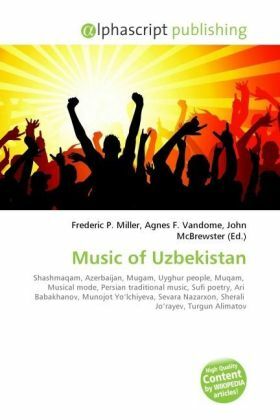 The name, which translates as six maqams refers to the structure of the music, which contains six sections in different musical modes, similar to classical Persian music. Interludes of spoken Sufi poetry interrupt the music, typically beginning at a low register and gradually ascending to a climax before calming back down to the beginning tone. Endurance of listening and continual audiences that attend events, such as bazms or weddings, is what makes the folk-pop style of music so popular. The classical music in Uzbekistan is very different than that of the pop music. Mostly men listen to solo or duo shows during a morning or evening meeting amongst men. Shash maqam, which is the main component of the classical genre of music. The large support of the musicians came from high class families, which meant the patronage was to be paid to the Shash maqam above all things.